Towering cumulus as storms begin firing to the south of Chickasha, OK. 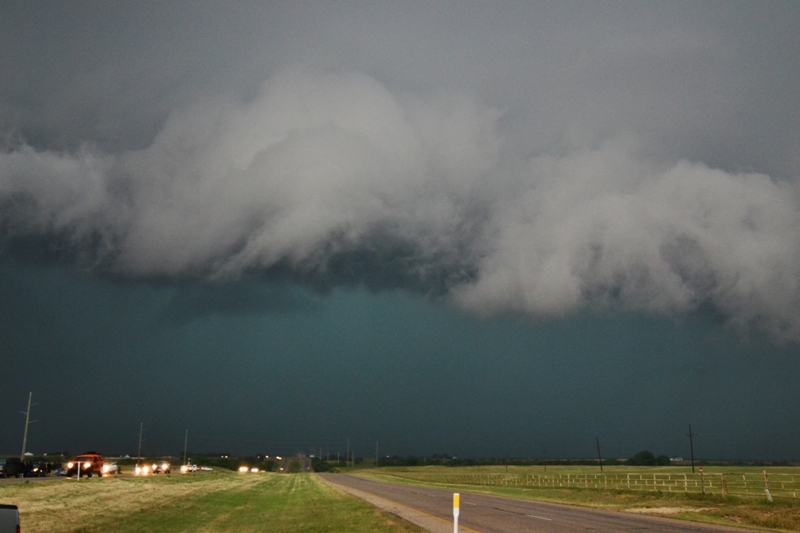 The right updraft is the beginning of the storm that spawned the Moore, OK EF-5 tornado. 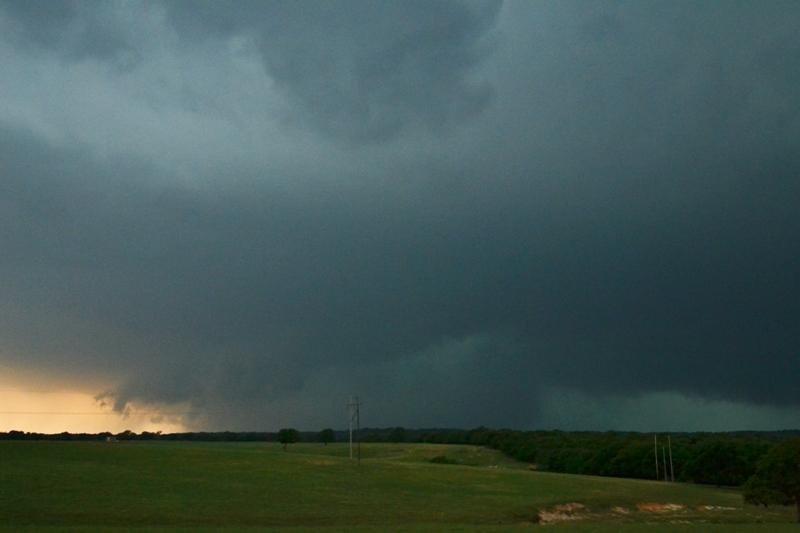 Tornado in the distance near Bray, OK. Another wall cloud in the foreground from closer storm. Wall cloud on the storm near Pernell, OK.
Hail and rain core embedded in the hook echo of the tornado warned storm west of Nocona, TX. 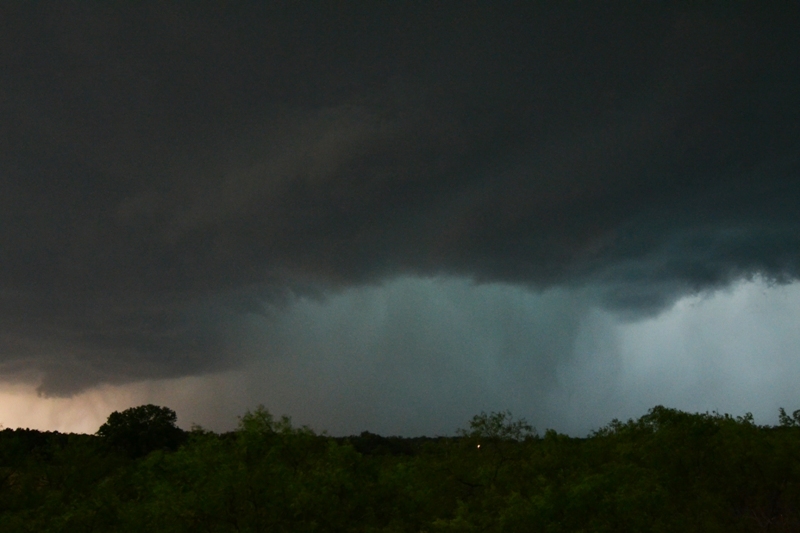 Another shot of the rain and hail core getting closer to us just before we left the area. Storm approaching us near Muenster, TX. Tour guests enjoying the view of the storm and taking pictures towards the end of the day's chase. In the Bear's Cage of the Nocona storm as it was tornado warned. I flew into Oklahoma City on this morning after working for a week in Greenville, SC, anticipating chasing right out of the gate. Even though this was the arrival day for the gusts of Silver Lining Tours, there were some guests that flew in early and others that stayed a day late to chase with Roger Hill and the gang, so we ended up with a full group. 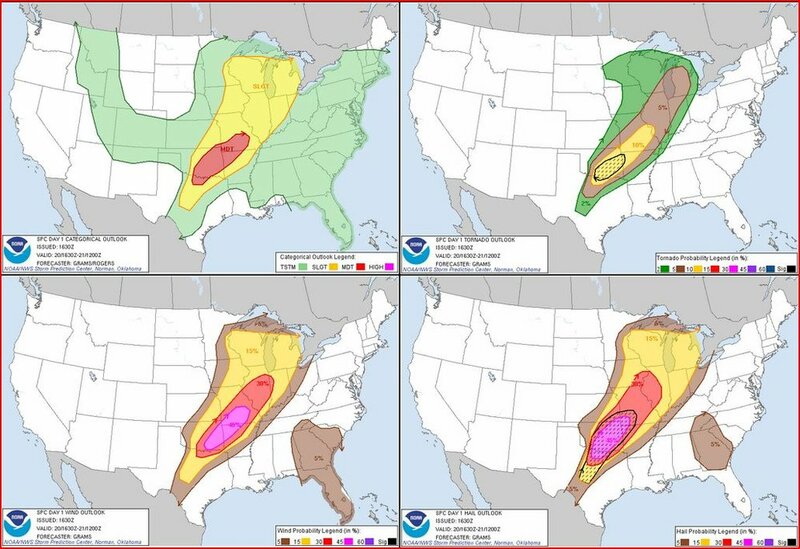 The previous day produced big tornadoes through central OK and southern KS and this day’s set-up was not much different as expectations were high for another big tornado day. The set-up included a stationary front draped through central OK to a surface low and triple point just west of the OKC Metro and a dryline to the south. Low level winds were veered a bit at the surface but moisture and instability were more than sufficient for supercells and tornadoes. Winds became more backed at the surface by the late afternoon and there was also 50-60 kts of Effective Bulk Shear entering the region by that time. A Tornado Watch was issued at 1:10 PM CDT for all of central and eastern OK.
As the first towers started going up during the early afternoon, we progressed southwest on I-44 towards Chickasha. One storm had already caught our interest and was looking the best just east of Lawton. As we neared Chickasha, I noticed the storms starting to get going just to our north that would be approaching Oklahoma City. 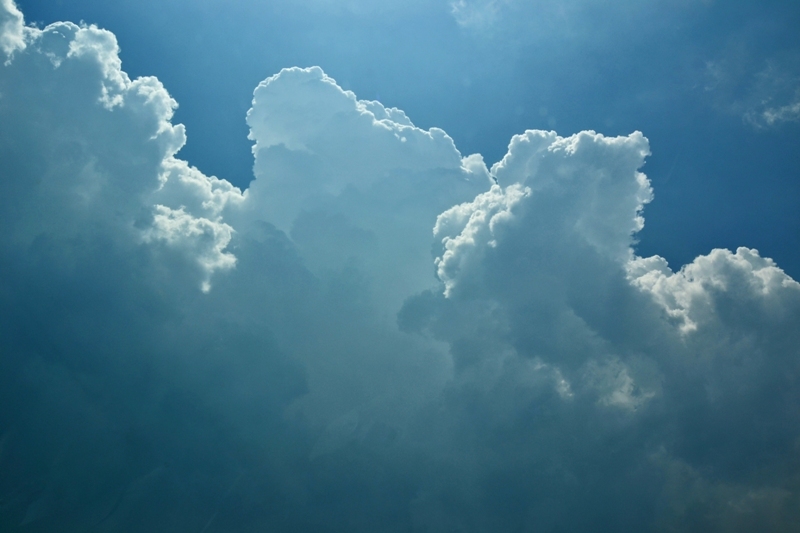 Even though the storms developing here were going up in a good environment and on a triple point, the decision was made not to follow due to the likelihood of these storms going into a major urban area. We decided to head on Hwy 19 to Lindsey and then south on Hwy 76 towards the southern storm near Duncan and moving east. The northern storm that we blew off after seeing go up was the storm that produced the deadly EF-5 Moore tornado. We intercepted the Duncan storm in the vicinity of Velma as it became tornado warned. 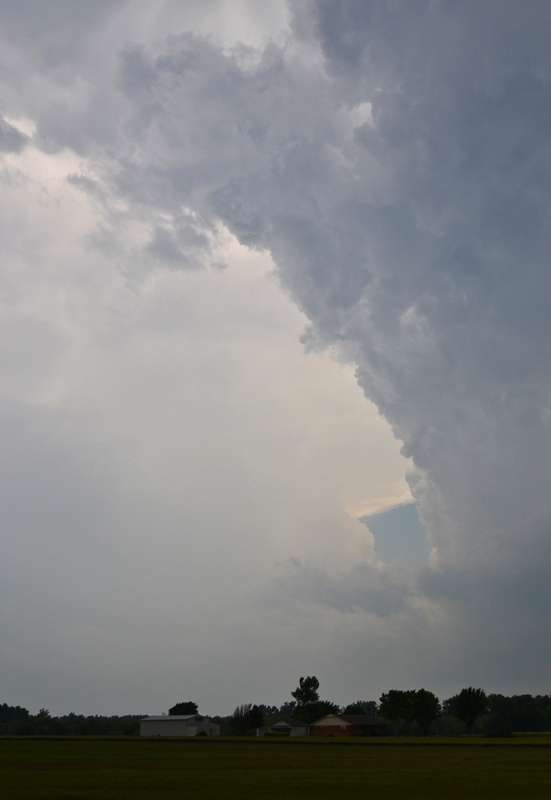 There was also a western updraft that was starting to take over the show. The storm we were on to the east had a nice lowering and eventually a wall cloud, but the western storm was the one to be on as it produced a tornado several miles to our west, which we could barely see in the distance. It was a nice tapered cone and we could see it rope out in the distance as our wall cloud closest to us failed to do anything. After both storms weakened, we progressed south of the Red River where a large HP (high precipitation) storm was moving due east along Hwy 82 in far northern TX. 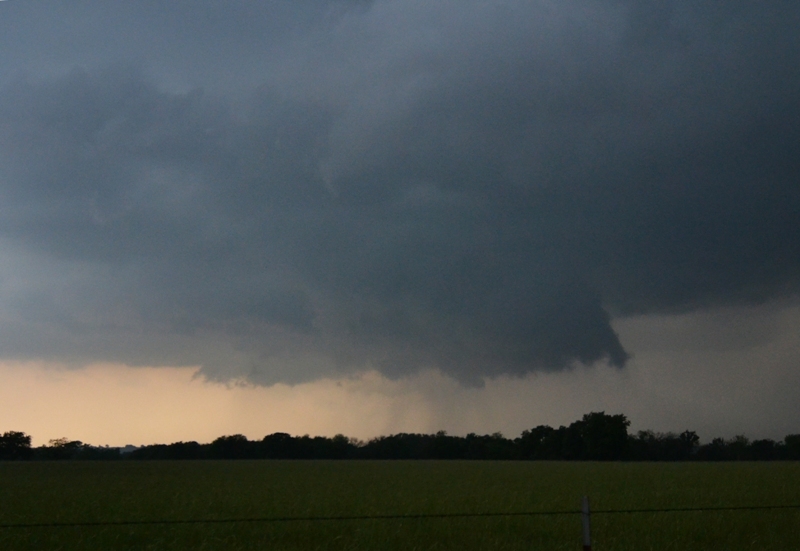 We intercepted this storm near Nocona as sunset was approaching. This storm initially had some good structure and we got right into the notch as the storm was tornado warned and had a nice hook echo on radar. The hook was wrapping in and we did not notice a wall cloud at that time, although a brief tornado was reported before we got there. We got out of there before the large hail started falling and called it a night as the storm became even more HP and started to spit out a gust front.